One day a group of neighbors from the UNWA community were on one of the walks we often take together to get to know one another better when we stumbled upon 25 doors dumped in an alley. This was a perfect metaphor of how our neighborhood was seen from the outside: someone in the city decided we were no longer useful or had any value so we’d been discarded and left to be forgotten. At the same time, those same someones couldn’t see the hidden vitality of those doors or how they could be re-purposed. 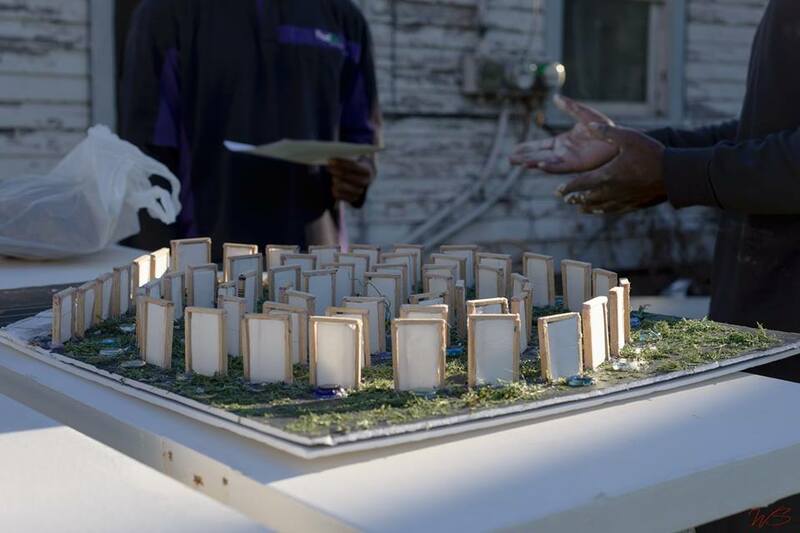 One of our artist neighbors, Gary Sharp, came up with the idea to do an installation on an empty lot using those doors to form a labyrinth and the artists in our neighborhood to tell their stories. A function of the door project is about reinventing economics. One stories as currency. Their story, who they are and how they see the neighborhood, are the community assets. Another way is to pay our local artists for their art, drawing money into the community and directly into the hands of citizens. All of our artists have things they want to draw out of themselves. They need to tell their stories as much as people need to hear them. Oftentimes we talk about the lack of community and how we see our neighbors. We allow people’s perceptions and labels of others to interfere with how we see the world. We like to change these perceptions by putting an emphasis on the narratives of the whole people in communities that most see as deficient. We take the positive images of people in our neighborhood to tell their stories. This has and will continue to spark interest and conversations among our neighbors, each artist and work challenging others. Many have shown interest in painting their stories, sharing their passions and worldviews, and being celebrated in this manner. What started as a 25 door project has ballooned to nearly 70 doors (with the help of our ROW partners). We want to show there is life and joy in a community that outsiders consider needing revitalization. We intend to show all the Vitality that already exists in this places. The full labyrinth installation won’t be until Spring 2017, but there will be pop up installations at various exhibit so that people can begin to catch a vision of it.